Fort Stoddert, located not far up the creek from the Little Tonoloway Recreation Area, was a small frontier fort built in the summer of 1755. It was protected by 15 men under the command of Lieutenant Stoddert. Soldiers reported gruesome massacres on the road to Fort Stoddert – houses were burned, livestock was slaughtered, and men were killed. 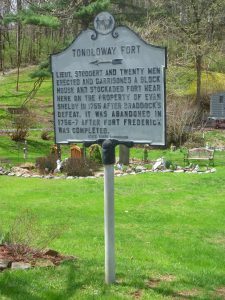 The fort was abandoned in August 1756 for Fort Frederick.